First degrees in Aerospace Engineering (formally) and Physics (informally) at the Technion. Yair completed his M.Sc. at the Technion in 2014, during his military service as an engineer developing aerospace systems. Participated in the Technion Excellence Program: October 2005- July 2008. 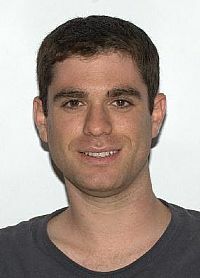 Yair built a multi-disciplinary curriculum combining aeronautical engineering studies with many courses in physics that allowed him to study advanced subjects in both fields. 1. Along with another student at his department he carried out a research project on the dynamics of the brain after a head impact. The purpose of this study was to create a simple model of the brain, meninges and cerebrospinal fluid (CSF) that would allow them to discern the important factors that cause or prevent brain injury due to head acceleration/deceleration. The research received one of the Seginer Awards for Research from the Aerospace department. The project was done under the guidance of Prof. Gil Iosilevskii of the Aerospace Engineering Department, and with the cooperation of Dr. Abeshaus and Prof. Menashe Zaaroor of the Department of Neurosurgery at Rambam Healthcare Campus. 2. As a final project in the undergraduate studies in Aerospace, Yair was part of a team of students that researched the aerodynamics of "wingsuits". The purpose of this study was to create a basis for understanding the characteristics of fabric skydiving suits with "wings", designed for high performance flight. Furthermore, they sought to design an "optimal" suit and find the pilot requirements that would allow the highest gliding qualities. The research included the creation of analytical and empirical models, intensive wind-tunnel experiments with a specially designed miniature human model, testing of pilot physical load limits at a gym and the design of a wingsuit simulator to test handling capabilities of the different models. The research received the award for best student research project at the 49th Israel Annual Conference on Aerospace Sciences and the second prize of the 2009 Technological Innovation Award from the Technion. The project was done under the guidance of Prof. Gil Iosilevskii. M.Sc. – Aerospace Engineering at the Technion. Thesis: “Lift generation by flapping wings in hover”, supervised by Prof. Gil Iosilveskii. Yair developed and studied a novel model for insect flight. In his model, the motion of the wing is a consequence of forces acting its root which comply with the morphological limitations of insect biomechanics, as opposed to the traditional approach of modeling insect aerodynamics by prescribed motion. He showed that the new approach is able to predict the hovering capability of insects. Furthermore, it allows optimization of the attainable motions using only a few parameters – a feat which cannot be achieved with the traditional approach. Recommendation to Program participants: "use the opportunity you've been given to begin research already during your undergraduate studies. Don't use the time only for courses – research is the best way to broaden your horizons and introduce your creativity into your work". Today (2017): PhD student in Chemical Physics at the Weizmann Institute of Science, with Prof. Ed Narevicius (https://www.weizmann.ac.il/chemphys/edn/), and an Azrieli Fellow (http://fellows.azrielifoundation.org/pages-en-394). Yair studies chemical and physical phenomena unique to extremely low temperatures. Contrary to the physics that we experience daily, at temperatures close to absolute zero the interactions between particles of matter are dominated by quantum mechanics, and atoms start behaving as waves. Yair uses experimental and computational tools borrowed from aerospace engineering to research and develop a novel cooling technique that would bring molecules to these temperatures. Using this method, he aims to observe the coldest chemical reactions ever identified on the molecular level, and even hopes to create new states of matter, very different from those familiar to us today. 1. Segev, Y., Bibelnik, N., Akerman, N., Shagam, Y., Luski, A., Karpov, M., Narevicius, J. & Narevicius, E. (2017). "Molecular beam brightening by shock-wave suppression". Science Advances 3, no. 3, e1602258. http://dx.doi.org/10.1126/sciadv.1602258. 2. Akerman, N., Karpov, M., Segev, Y., Bibelnik, N., Narevicius, J. & Narevicius, E. (2016). "Trapping of molecular Oxygen together with Lithium atoms". Submitted. Phys. Rev. Lett. 119. http://dx.doi.org/10.1103/PhysRevLett.119.073204. 1. Segev, Y. & Brandeis, J. (2009). "Aerodynamics in Rarefied Gas Environment using DSMC Simulation". Presented at 49th Israel Annual Conference on Aerospace Sciences. 2. Segev, Y., Yablochkin, E., Green, Y., Mintz, L., Neeman, O., Levin, R. & Iosilevskii, G. (2009). "Aerodynamic Design of a Wingsuit". Presented at 49th Israel Annual Conference on Aerospace Sciences.